The audience is soothed with music performed by harpist Ruth Freedman. 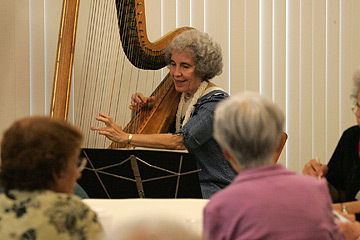 THE SOOTHING, angelic sounds of the harp attracted the attention of Ruth Freedman decades ago. While attending nursing school, she was introduced to the instrument while watching her college roommate, a music major, practice the piano. "They offered free lessons, so I thought, why not?" said Freedman. The former nurse now views music as a form of medicine. She has played at skilled-care facilities, hospitals, at the bedsides of dying patients and for the residents of Kalaupapa. In settings where anxiety and tension run high, the soothing music appears to help, she said. "It really helps to calm the agitated patients. You can see people relax; it provides some sense of peace." Freedman was raised in Los Angeles and worked in a leprosy hospital in Israel before heading to Molokai. Residents of Kalaupapa "had never physically seen a harp before. It was love at first sight," she said. She has since learned to love Hawaiian music. The 1,000 songs in her repertoire include Hawaiian, Korean, Filipino, Japanese and other ethnic music -- along with the classics, religious hymns, holiday music and even some top 40. "I enjoy playing all different kinds of pieces. I want total variation," she said. "By listening to music they've never heard before, it brings new vistas to their life. The music is both calming and distracting. The resonance of such a large instrument is so therapeutic -- from the vibration as well as the beauty of the tone." Her goals include playing for coma patients and mothers during childbirth. One of her favorite gigs was playing Mrs. Santa Claus at Honolulu Hale's Honolulu City Lights display. "Thousands of people came through wanting to finish Christmas in a grand manner." Freedman's father was a patient at Hale Ola Kino, a skilled-care facility on Kalakaua Avenue, during the last month of his life. "I brought the harp there and played for him. I got pretty good playing for him. He had given me a new career," she said. Freedman retired from her 30-year nursing career after her father's death. "My dad was my last patient."